Happy first day of March! I cannot believe we are already three months in 2017! Time sure is flying by, especially with how crazy busy I’ve been lately. It’s time for me to participate in #FoodieExtravaganza again, a monthly blogging event where each theme comes from a National Food Holiday. In celebration of Spanish paella day, the theme for this month is paella. Our host is Sue of Palatable Pastimes. I first learned about paella in seventh or eighth grade during Spanish class when we began discussing foods. 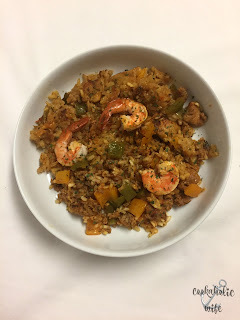 At the time, I had a very picky palette and I had no idea if I was going to like a dish that combined proteins together along with rice and vegetables. A few months later my family was visiting my aunt and uncle at their house at the beach and my uncle announced that we were having paella for dinner. I was super excited to try it since I knew what it was! Does it ruin the story if I tell you I can’t remember if I liked it or not? Sorry, but that’s the truth. I’m fairly certain I did, but the memory I have is more about recognizing the dish and talking to my uncle about the ingredients included in it. Now that I’m much less picky, I know that I’m going to the dish and was thrilled to be able to make it again for this event. Paella comes in different versions; vegetarian, seafood, Valencia and mixed, which means a combination of sea and land proteins. I decided to do a mixed paella simply because I had all three proteins in the freezer. 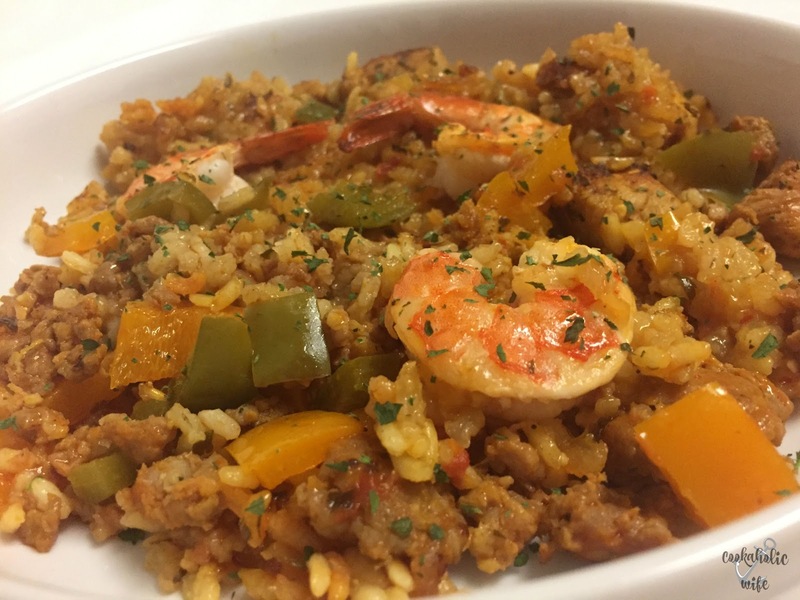 This Spanish dish made with chicken, sausage and shrimp takes a little while but you’ll be more than rewarded with the great flavors. 1. Combine the chicken, olive oil, oregano, paprika, salt and pepper together, tossing until well coated. Refrigerate for 30 minutes. 2. In a large shallow pan, prepare the sofrito by heating the olive oil over medium heat. Add the onion and cook until softened, then add the garlic and cook 1 minute more. Stir in the fresh parsley, paprika and crushed tomatoes and cook until all of the liquids have evaporated from the pan. Remove from the heat and set aside. 4. Push the sofrito to the side of the pan and add the rice to the other. Cook for 1 minute, allowing the rice to become lightly toasted. Stir in the smoked paprika, crushed red pepper flakes, turmeric, bay leaf, and lemon zest. 4. Add the sausage, chicken and bell peppers to the sofrito and rice along with 2 cups of chicken stock. Bring to a boil then reduce to a simmer, shaking the pan but not stirring the rice. Add more chicken stock if it cooks off too quickly. The rice should be al dente in 20 minutes. 6. Place the shrimp on top of the rice, but do not stir in. Cover with foil and increase the heat to medium for 1-2 minutes to develop the socarrat, the caramelized crust of rice on the bottom of the pan, then remove from the heat. 7. Allow the pan to rest for 5-10 minutes before serving. To make this a weeknight recipe: prepare the sofrito, cook the sausage and marinate the chicken one day in advance. I know that looks like an insane amount of ingredients, but paella has a ton of flavor and that flavor needs to be developed over time. 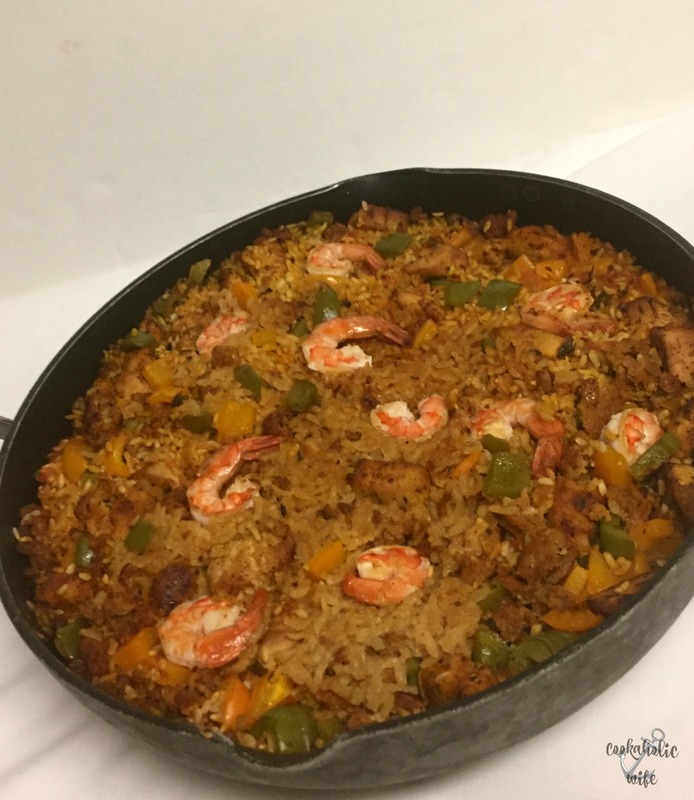 Paella is traditionally served in the pan it is cooked in so you can bring it right to your table as is, or your can divide out portions onto plates. I would give myself for this dish of this paella, since love rice in any form.